Red Bike Project volunteer at the 2010 painting party. Each year there are two painting parties hosted by Budget Bicycle Center and the 105.5FM Triple M Green Team. 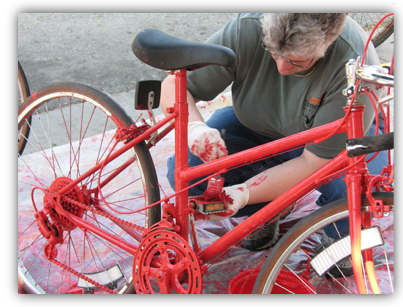 The Red Bike Project relies heavily on volunteer work so roll up your sleeves and help support the Project and have fun at the same time. Want to Volunteer to Paint? Any help painting is appreciated. Paint as few as one Red Bike or paint a dozen. Painting is done outdoors on the third and fourth Saturdays in May. Wear clothes that won’t be ruined by red paint. Brushes, gloves, paint and THANK YOU’S provided. 2013 Painting Party: June 23rd. 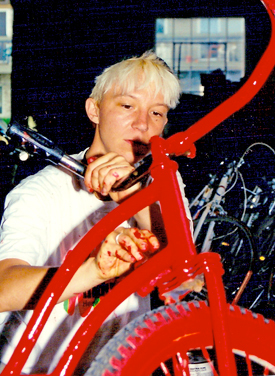 Red Bike Project Founder Jillian Painting Red Bikes in 1996.